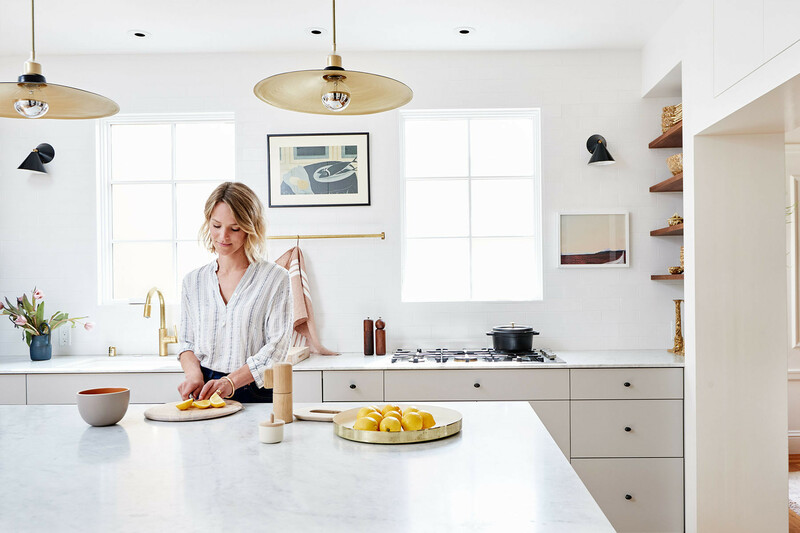 Interior designer Katie Martinez decorates her Outer Richmond home with eclectic, mid-century finds and sentimental family heirlooms. Chop Wood Co. Custom Sofa | Article Armchairs | Vintage Armchairs | Erica Tanov, Amber Interiors, Aesthetic Union Pillows | Parachute Throw | Armadillo Rug | Anthropologie Side Table | Nickey Kehoe Coffee Table | Gubi Floor Lamp | Vintage Planter | Max Lamb Stool | General Store Stool | Tom Dixon French Press | Blackcreek Mercantile & Trading Co. Bowl. Photographed by Maria del Rio for Lonny, styled by Kendra Smoot. 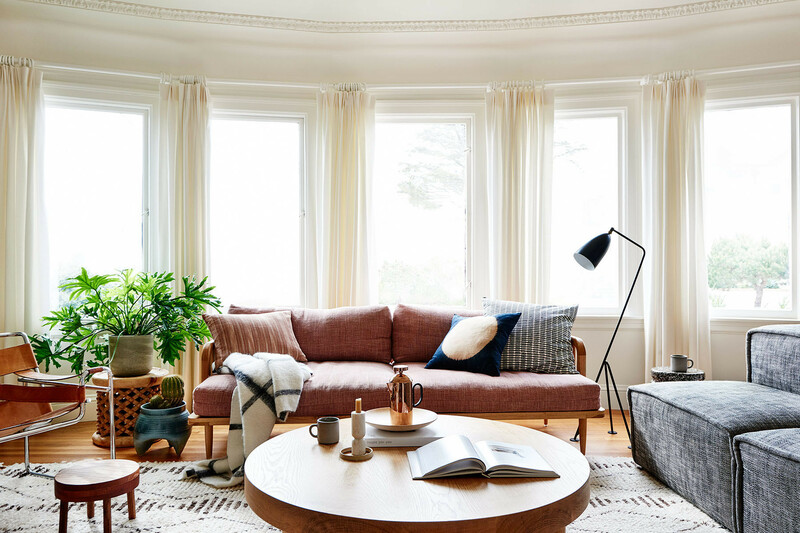 There is nothing ordinary about Katie Martinez' restored San Francisco home or the assortment of treasures you'll find inside it. The interior designer had very nearly "given up hope" on finding her Outer Richmond address when she experienced a chance encounter with what would soon be her new family home. "We happened to come home early from a Labor Day weekend away with friends — too many babies, too little sleep," Martinez recalls when asked how she first discovered her home. "We stopped in at the open house which was sparsely attended because of the holiday weekend. We actually bid on the house thinking we had absolutely no chance — and we got it." "We fell in love the view of Ocean Beach and the fact that it hadn’t been remodeled and still had character. I adored the completely unfinished lower level, which would eventually become my studio." Several years, a rejigged floor plan, and multiple coats of fresh white paint later, and the Martinez' restored family home now ticks every eclectic box. "I like that you can’t quite put your finger on it," says Martinez, of her unique aesthetic. "The layout is mostly open in the sense that the rooms flow into each other through wide doorways but each room is still very much so its own entity. This adds to the not traditional but also not entirely modern vibe." Step inside this grandiose space and the historian inside you will be besotted. Decorative curved ceilings boast the kind of character you'd typically see in a 19th century build, while mounted mid-century sconce lights do their best to steal the show. Martinez and her husband Michael admit that ensuring their home was artfully restored to its former glory, without detracting from any of its original fixtures, was no easy feat. "I love that we were able to retain the character of the house by keeping much of the original architectural details," says the designer. "We decided to knock out the original, tiny kitchen, the adjacent breakfast room, and interior hallway to create a more open space," she explains. "I like how the kitchen is literally and figuratively, the heart of this home — it’s right in the middle of the floor plan and almost all the rooms flow from it." The designer knocked out the original kitchen to make way for a contemporary culinary hub that sits in the very center of their floor plan. Brendan Ravenhill Pendant Lights | Menu Bar Stools | Custom Shelving | Newport Brass Faucet | Custom Cararra Marble Counter | Vintage Ceramics | Areti Wall Sconce | George Braque Artwork | Benjamin Moore Paint. The newly minted kitchen now boasts a Carrara marble bar, complete with vintage pendant lights by Brendan Ravenhill. Take a peek around the corner and you'll be wowed by Martinez's organized open shelving, showcasing uniform handmade ceramics from the South of France, acquired through her grandmother. Matte black Areti wall sconces and a Newport Brass kitchen faucet, complete the mid-century-meets-traditionalist look and feel. The exposed brick walls, now awash in Chantilly Lace by Benjamin Moore, further set the tone for a refined and utterly refreshing restoration. 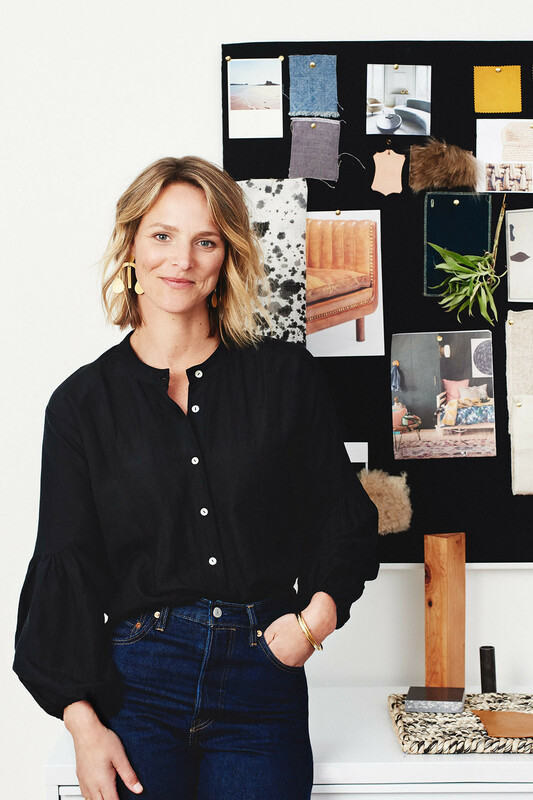 The interior designer admits she consciously steers clear of fleeting industry trends, opting instead to source heritage pieces, or reconfigure old furniture, passed down through family and friends. There's an artistry and understanding that's far from beginner's luck. Despite the ornate original detailing, there's no mistaking that this 1920s build received a second chance at life the day it met Martinez. "I really wanted to get the layout right," the designer admits. "If you can get that accomplished, the rest is always so much easier." "There isn't one defining look or style. Much of the furniture and art is personal and has a story," says Martinez. Vintage Armchair | Marino Marini Artwork | Amazon Sheepskins | The Citizenry Basket | Workstead Wall Sconce | Benjamin Moore Paint. An original floor plan that easily could have been described as clunky and out-of-date now oozes with contemporary charm. The open kitchen anchors the home, while the primary living area, boasting a wraparound bay window, creamy drapes, and original plaster work, floods with natural light on sunny San Francisco days. Assorted Article armchairs, vintage Wassily inspired masterpieces, a cozy throw, and a mid-century custom pink sofa by local furniture-maker Chop Wood Co., reaffirm the designer's penchant for unique showpieces. 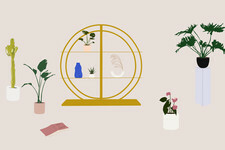 It doesn't take long inside Martinez's home to understand that the designer has mastered the art of decorating her space with sentimental finds, furniture she loves, and accents that mean something. Open shelves house stacks of books and wicker baskets, equipped with blankets, throws, and assorted textiles — "It can be gray out here by the beach," Martinez insists. Navy blue sheepskins layer the floor, mirroring the splash of inky paint inside the original fireplace. "We are constantly moving the sheepskins around," she says. "I find texture essential if you go for white walls — otherwise the rooms feel too cold and sterile." Original fixtures, from the hearth of the fireplace to the trim of the ceiling, carefully harp back to their former glory. While there is nothing traditional about the couple's approach to styling or penchant for mid-century furniture, their home is undoubtedly steeped in history, a tasteful nod to its '20s revival. Glide through to the dining room and the old and the new collide in spectacular style. 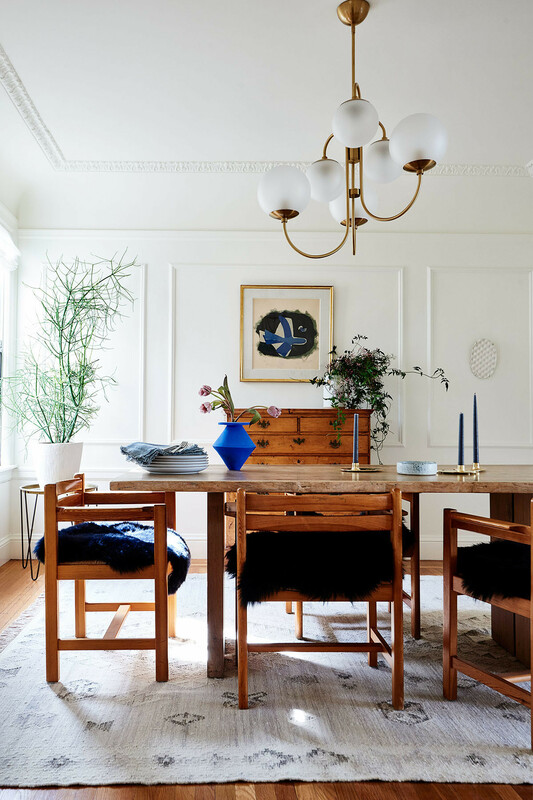 A modern chandelier from West Elm, lengthy dining table by Crate and Barrel, and vintage dining chairs from Nickey Kehoe complete with blue sheepskins sourced on Amazon, capture the essence of Martinez' creative restoration. The family's previously formal dining room fuses contemporary living with old-world charm. West Elm Chandelier | Crate & Barrel Dining Table | Nickey Kehoe Dining Chairs | Amazon Sheepskins | Flora Grubb Potted Plant | George Braque Artwork | Jono Pandolfi Ceramic | Big Zippy Vase | Ilse Crawford Candlesticks | Rejuvenation Rug | Heath, RW Guild Ceramics. "I love how having children has changed our home and how we use it," Martinez explains. "We’re on the floor more, we have so many more baskets, their artwork is everywhere. I’ve created little nooks and corners in every room for them. A lot of children’s things can be beautiful, and they add so much life and fun to a room. 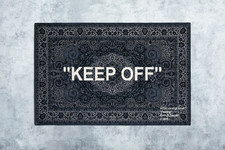 You just have to be selective and thoughtful in what you purchase and keep." Martinez' home is filled with childlike treasures, including this striking custom-made wall hanging, created for the designer by her close friend Lana Weber of de Lana Textiles. Custom Daybed | de Lana Textiles Bedding | The Container Store Baskets | Custom, Jenny Pennywood Pillows | Amazon Sheepskin | Custom Branch Mobile | Barn Light Electric Wall Sconce. 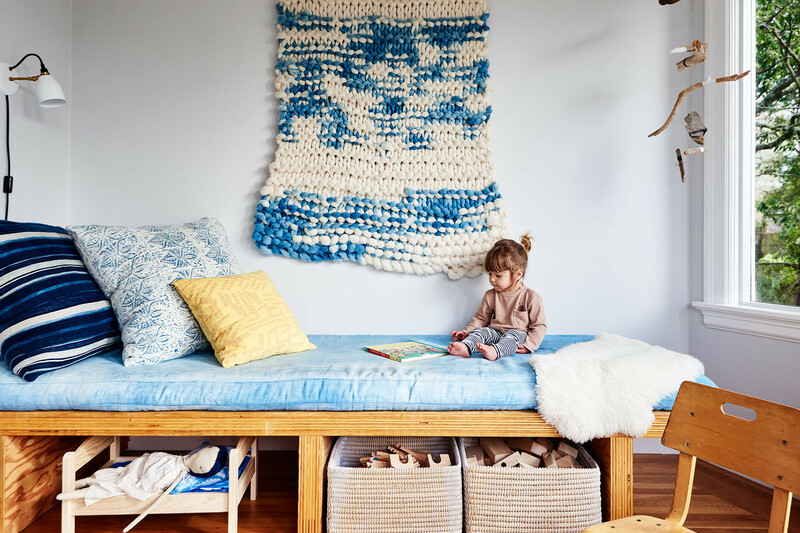 A reclaimed office desk that once stood in Martinez' old work space has been creatively reworked into a daybed, sitting pretty in her daughters' bedroom, dressed in blue linen hand-dyed by her closest friend, Lana Weber of de Lana Textiles. Martinez admits the presence of her children is evident in "just about every corner" of the family home, something the couple showcase rather than try to mask. Two adjacent twin beds — both vintage, once owned by Martinez' great grandparents — further enhance the bedroom's dollhouse appeal, while a mobile fashioned out of branches (made by her husband) sways in the breeze. "The beds were custom-made to be extra long, since my great grandfather was very tall," says the designer. "So now I can’t find a mattress that fits them perfectly, but I love them anyways." Paper taxidermy animal heads from Nickey Kehoe are mounted overhead, while a poster by Mike Mills sits between them. "The girls beds were originally my great grandparents beds," says Martinez. "They were custom-made to be extra long since my great grandfather was very tall." 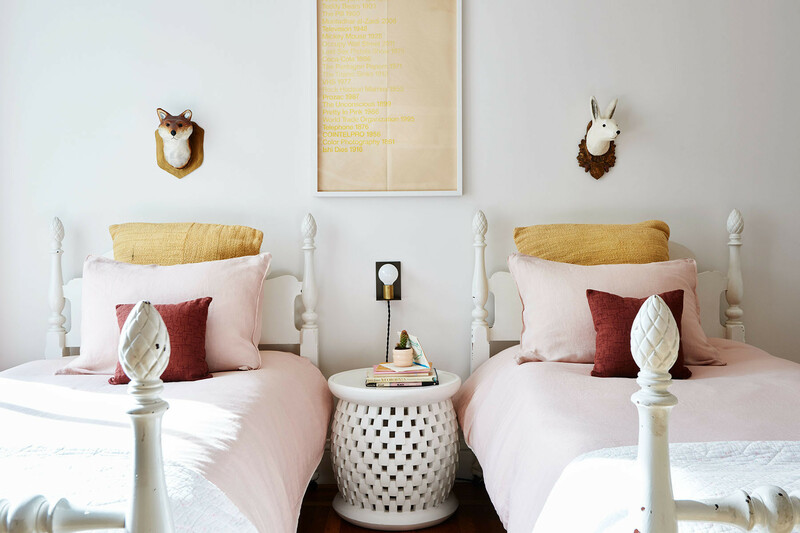 Serena & Lily Stool | Two Dawson Linen | Mike Mills Poster | Nickey Kehoe Paper Taxidermy Heads | Schoolhouse Electric Sconce. Move to the master bedroom — complete with inky blue walls by Farrow and Ball, hardwood floors, a walnut bed by Room & Board, and a quintessentially Californian Eames lounge chair — and it's yet another nod to Martinez' adoration for mid-century marvels. 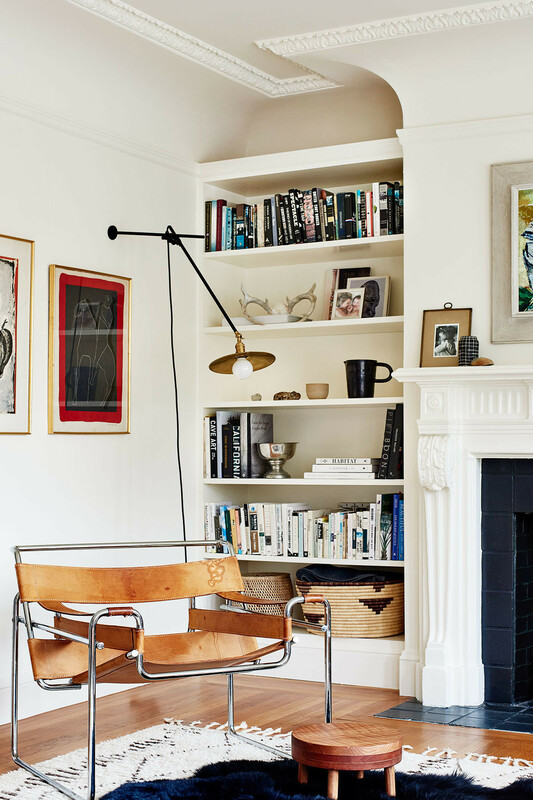 "I gravitate towards more contemporary, mid-century lighting," she says. "I like how it plays off of vintage and traditional furniture and utilitarian spaces." 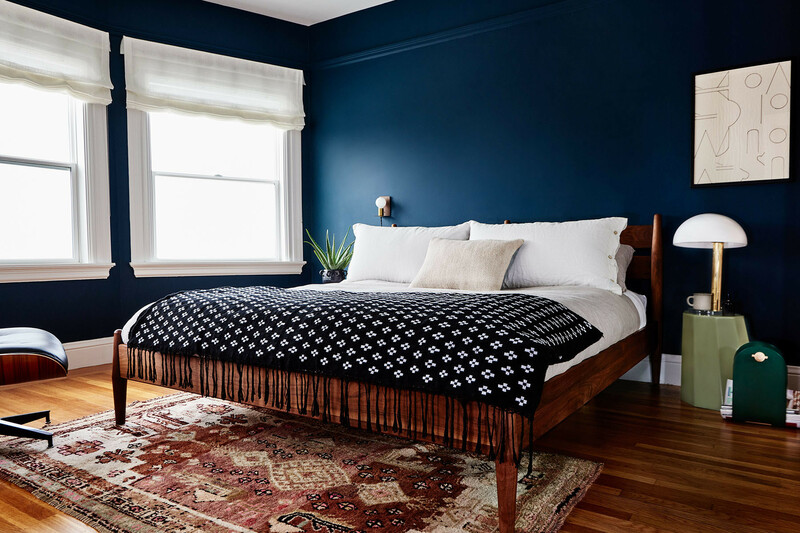 A deep shade of Hague Blue by Farrow & Ball sets the tone in the moody master bedroom. Room & Board Bed | Rough Linen Bedding | L’Aviva Home Throw | Eames Lounge Chair | Amy Reid Hirst Wall Art | Loom & Kiln Rug | Martino Gamper Stool | Vintage Lamp. Lighting, in all its glorious forms, decorates the designer's address. Floating bulbs, decorative brass pendants, modern chandeliers, and monochromatic floor lamps, cleverly tie Martinez' style together, while the designer's penchant for pattern play is front and center through her approach to wallpaper. "I love having wallpaper in small spaces," she admits. "Like our bar and in the girls’ bathroom, it’s usually the first thing guests comment on." 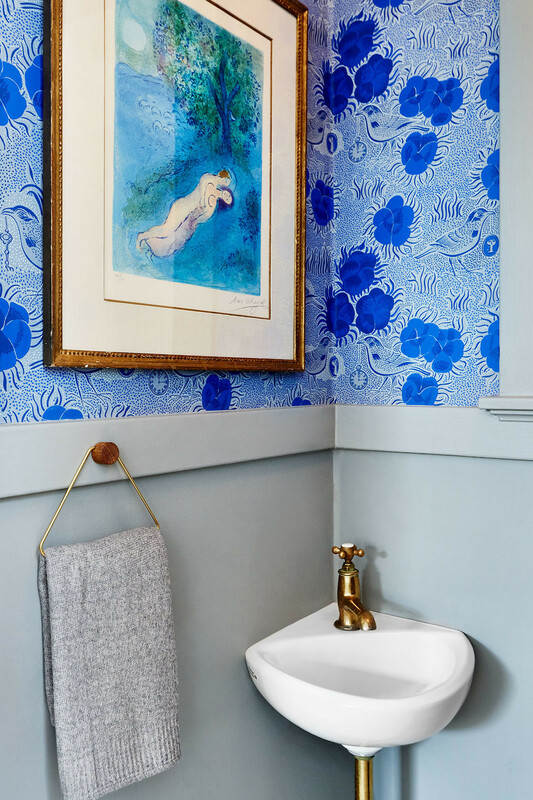 A bold, blue floral wall covering by Tiina The Store decorates an otherwise awkward nook-of-a-bathroom space, while a dreamy artwork by Marc Chagall and gold hardware by Waterworks completes the vibe. The designer gives tiny Art Deco spaces new life with bold, eclectic wallpaper. Tiina The Store Wallpaper | Marc Chagall Vintage Artwork | Waterworks Hardware. While restoring and redecorating a period home is certainly no small task, Martinez' restored San Francisco oddball is a shining example of just how thoughtfully it can be done. It's this sense of quirk and character that the designer has worked tirelessly to protect and preserve. Scouting out one-of-a-kind pieces is key, admits Martinez. "There isn’t one defining look or style. Most of our furniture and art is extremely personal, it has a backstory — whether it's been built or designed by a close friend, or passed down through a family member." "Try to find a few things that are truly one-of-a-kind," Martinez explains. As for the designer's pro tips for would-be decorators? Make no mistake, character is key. "Remember, great pieces don’t have to be fancy — or expensive."